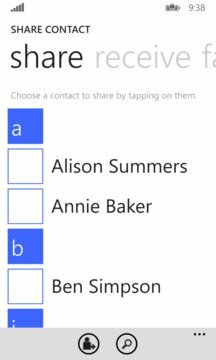 Unlike other contact sharing apps, Share Contact allows you to both (easily) send and *receive* contact details with other smartphone users. Share contacts via SMS, email or QR code. 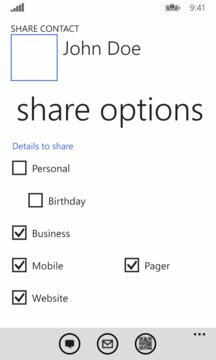 Receive contacts by pasting the contents of your received message (SMS or email) into the app, or using Bing Vision search (QR Codes). Fixed an intermittent bug causing a crash when displaying the settings screen. Jump list, search and filtering (by account and available contact information) to make finding contacts easy. Share via SMS, email and QR Code. Easily save received info as a contact in your phone using the inbuilt receive mechanism for SMS & email. Choose to send business, personal details or both. For contacts with linked accounts view contact information by account. Choose to send details for one account, or full contact details merged from linked accounts. Fixed the 'include app link' setting not saving.